Do you need help creating a design vision for your home or office but it's not coming together? For over 25 years, I've helped my clients achieve the interior style that reflects them. At Blue Desert Interiors, we are the only design firm in the valley that specializes in home interior design, office interior design and healthcare interior design. Because of this extensive experience, we can help you build or renovate your new home, build out a new office space, or even help your facility create a healing environment. You can learn more about us on our Interior Design Services page and About Us page. We look forward to hearing from you! 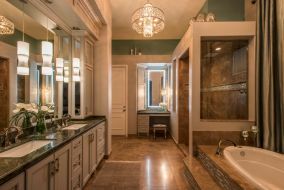 We recently finished this stunning master bathroom remodel. Head over to the Troon Master Bath page to see the final results with beautiful polished nickel fixtures and a perfect makeup area! Phoenix, Carefree, Cave Creek, Paradise Valley, Chandler, Gilbert, Mesa, Scottsdale, Chandler, Tempe, Gold Canyon, and Glendale.